“Nilsson is at her peak, especially in GÖTTERDÄMMERUNG, singing with absolute security and showing a degree of involvement not always heard in later performances; most especially, she projects a vulnerabilty that is touching and totally convincing! I don't understand the lack of enthusiasm that surrounds the name of Hans Hopf. Here, he is simply thrilling as Siegfried, a true Heldentenor. This is a treasurable RING, and I would recommend it to anyone. Not being terribly fond of any of the stereo RINGS, this Kempe RING would be my first choice, along with Knappertsbusch's 1956 Bayreuth set." "Thomas Stewart, was an American baritone who was renowned for his portrayals of Wotan, Amfortas and other central Wagnerian roles and who was heard frequently at Bayreuth and the Metropolitan Opera....his commanding quality came less from the size or mettle of his voice, which was surprisingly lyrical for a Wagner baritone, but from his imaginative approach to his roles. He gave his characters a measure of warmth and expressivity that made them seem complex and surprising." 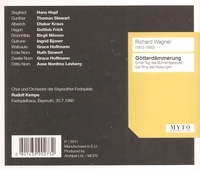 “In the Norwegian Radio production of GÖTTERDÄMMERUNG, mounted for Kirsten Flagstad in 1956, Ingrid Bjoner sang the Third Norn and Gutrune; and in 1957 she not only made her début with the Norwegian National Opera in Oslo as Donna Anna, but also sang the title role in Handel’s RODELINDA at the Drottningholm Festival at the invitation of Flagstad. Between 1957 and 1959 Bjoner was a member of the Wuppertal Opera and of the Deutsche Oper am Rhein in Düsseldorf-Duisburg between 1959 and 1961. She made her first appearance at the Vienna State Opera in 1959 and sang there regularly until 1986 in parts such as Desdemona, Leonore, Rezia, and the title rôles in ARIADNE AUF NAXOS and TURANDOT. In 1960 she made her débuts in San Francisco as Elsa and at the Bayreuth Festival as Freia, Helmwige, and Gutrune in DER RING, conducted by Rudolf Kempe. During the 1970s Bjoner sang in major opera houses, including those of Berlin (Deutsche Oper), Copenhagen, Madrid, Milan, Oslo, Pittsburgh, Stockholm and Stuttgart as well as at the Bayreuth Festival. Her first appearances at the Paris Opéra were in 1972, as Isolde and Tosca. She both directed and sang the title part in Elektra in Oslo in 1985, repeating this feat in Copenhagen during the following year, when she also sang Isolde at Bayreuth and the Kostelnicka at Karlsruhe. Bjoner recorded Elektra for Italian Radio in 1987 and returned to Munich in 1988 to sing the Empress. Her last operatic performance was at Karlsruhe in 1990, again with the Empress; she continued however to be active as a teacher in both Oslo and Copenhagen.